Monday, Oct. 17 – 7:15 p.m. – Windy weather made for another busy day for wildland firefighters in the Matanuska Valley. In addition to continuing their battle with a stubborn, late-season wildfire north of Palmer, Alaska Division of Forestry firefighters had to contend with three different wildfires caused by high winds blowing trees onto power lines. While State Forestry firefighters were able to corral the three power line fires before they got out of control, they and other firefighters still had their hands full with the 328-acre Moose Creek Fire north of Palmer. The Moose Creek Fire experienced a minor blowup early Monday morning and made a run south toward the Glenn Highway, coming within 75 feet of the highway near Mile 54 at one point. The increased activity forced fire managers to temporarily close the highway while a bulldozer was used to construct two dozer lines paralleling the fire to keep it from spreading toward the highway and farther west into the Moose Creek drainage, where it could threaten nearby residences. That operation proved successful and as of 6 p.m. firefighters were continuing their attempts to keep the fire contained and secure the perimeter, an effort that will continue through the night. The flare up early Monday pushed the estimated acreage up by 28 acres and dropped containment from 25 to 22 percent. The windy conditions and limited resources have made it hard for firefighters to get a handle on the fire, which is burning mostly in surface fuels such as dry leaf litter and grass. The wind has also produced spot fires as a result of the wind carrying embers into unburned fuel that has proved receptive to an ignition. Two helicopters equipped with water buckets are being used to supplement the efforts of firefighters on the ground and douse hot spots as they pop up. Resources continued to trickle in Monday after the Division of Forestry put out a call for help from other suppression agencies around the state because most of its seasonal work force has been laid off for the winter. There are currently more than 70 personnel working on the fire from multiple agencies that include the Division of Forestry, BLM Alaska Fire Service, National Park Service, U.S. Fish and Wildlife Service and U.S. Forest Service. On Monday, five firefighters from the Alaska Air National Guard joined the effort, as well as three additional smokejumpers from the BLM Alaska Fire Service. Four other firefighters from the Fairbanks Area Forestry office were enroute to the fire with an engine Monday night and will join the effort Tuesday morning, as will additional firefighters from the Tanana Chiefs Type 2 Initial Attack Crew. 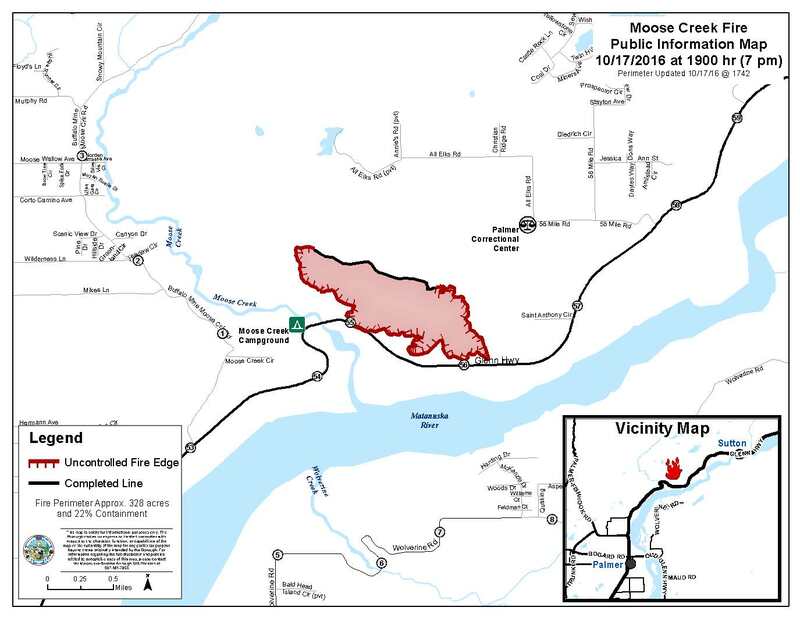 According to a State Forestry fire investigator, the Moose Creek Fire was started by an escaped debris burn early Saturday morning. It was only about 10 acres when it was reported but it grew quickly fanned by strong winds and was approximately 100 acres by the time firefighters arrived on scene. The wind hasn’t stopped blowing since, clocking steady speeds of 20-30 mph with gusts of 50-60 mph recorded at the Palmer Airport early Monday morning. While the Glenn Highway remains open, motorists should expect temporary delays as firefighters work to contain the fire. Motorists are asked to be patient and be alert for firefighters and firefighting equipment on the road between Miles 54-58. 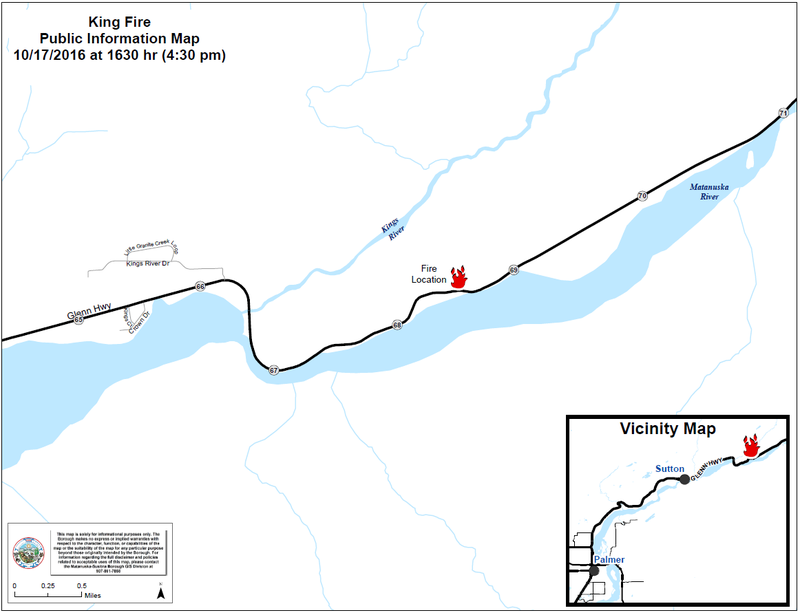 The biggest of the three power line fires was the King Fire near Mile 68.5 of the Glenn Highway just north of Sutton. That fire was reported at about 1 p.m. by a passing motorist. Engine crews and a helicopter from the Moose Creek Fire were diverted to the fire and were able to use bucket drops and hoses to corral it at an estimated 5 acres. Three smokejumpers from the BLM Alaska Fire Service were expected to arrive at around 5 p.m. Monday to take command of that fire.